Travelling to Ha Giang to see the sunlight falls into the highland villages, the upland fields of traditional flowers when you join tours: Indochina tours Vietnam with us. 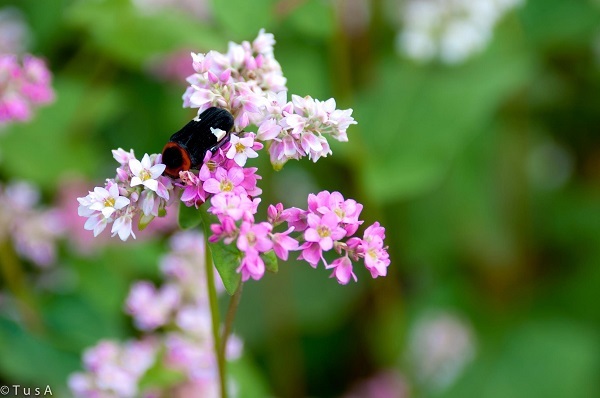 The best time to see the endless “traditional flowers” flowers blooming marvelously in every mountain, slope and fields in Ha Giang is form the early of October to the mid of November. It is the mid of October now and it is also the best time to visit Ha Giang and admire flower fields. As the local people say, back to the ancient times when Mong ethnic minority groups were desperately in search of food in a famine, they moved to every where all the time but they got nothing for their efforts. There were plenty of dark days. One day they smelled a waft perfume in the breeze which they have never smelled it. They followed the strange scent and saw traditional flowers flowers appeared among the rocks as a miracle. Nuts of this flower tasted as rice and corn. Its seeds then became the staple food of Mong people. Local people take flour of the traditional flowers (buckwheat) fruit to make cake and wine. traditional flowers leaves are used as cattle feed. Triangle buckwheat is a plant belonging to the rice, bounced from rice and corn, so-called Buckwheat, means “mach” in Vietnamese. Bunched petals make cone shape-“tam giac”; three triangles keep a particle in the middle. Flowers are fragile but own a wild beauty – an endless source of inspiration of traveller. How are traditional flowers flowers in Ha Giang special? Food made from traditional flowers. 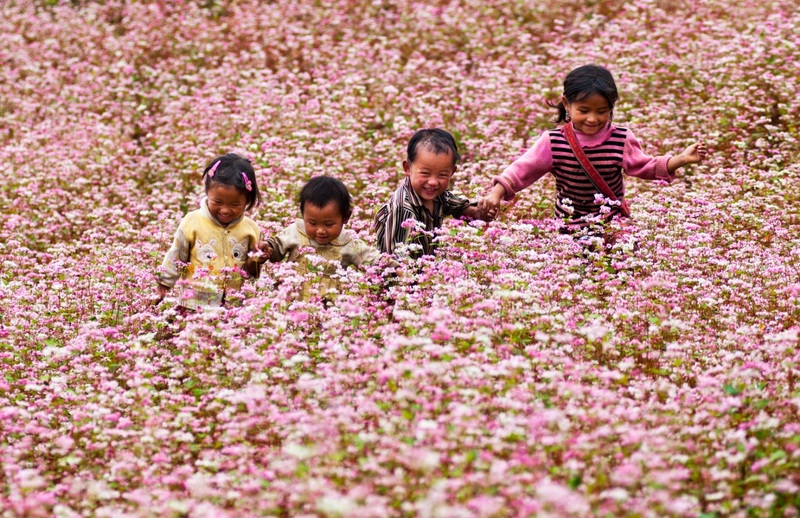 In Vietnam, Hmong people grow traditional flowers as food for themselves, feed for livestock. Traditional flowers is a food plant which is intercropped with soya bean. The plant is grown all year round by the Hmong ethnic minorities for food. After blossoming, ethnic people harvest traditional flowers (buckwheat) grain, dry and used to make bread, brew wine, livestock. Triangular flowers seeds are less than half his tiny black beans, crushed into fine powder truth. The dough with a mixture of water and pour into a soft plastic molds rolled into bread. Easy idea, but it turns out to stage grinding hard. Flour milled by hand, if artless bread very susceptible pigs, difficulty eating. Grain drying circuit triangle just how well is the secret. Delicious bread in markets is made from dried seed triangle circuit of a week in the sun’s yellow shiny stone plateau. Do not forget to stop mountainous fair place to enjoy the taste of flowers cakes baked traditional circuit of ethnic H’Mong. People also use the seeds to make porridge or mix it with corns in other dishes. Where to admire traditional flowers flower fields? Phố Cáo –Pho Cao is the first place with flowers flowers when you head to Dong Van. This place has some carpets of traditional flowers flowers lying near cliffs. On the road from Xi Man to Hoang Su Phi (Ha Giang), traditional flowers flower fields stretch along the roadside blooming in early sunny morning in border areas making up a special pink and white colors. Admiring the beauty, no one can utter the word “so beautiful”! Sủng Là – Sung La contains the best flowers fields in Ha Giang. The clusters of traditional flowers flowers stretching to horizon have dazzled many visitors. Walking along Sung La, you may have a chance to enjoy at least five traditional flowers flower fields. The best time to go to Ha Giang to see traditional flowers flowers. Flowers is the characterized flower in the northern mountainous provinces of Vietnam, with wild beauty. Traditional flowers buckwheatin late October and early November every year. Mid to end of October will be better to see when the weather has not been cold, the terraced fields are harvested, the pink and white flower carpet covering across the hillsides. How to go to Ha Giang to see traditional flowers flowers? Ha Giang is located over 300 kilometers from Hanoi. You may take a sleeper bus in My Dinh Bus Station (Hanoi – Ha Giang route) with tickets ranging from 250,000 to 300,000 VND. Sleeper bus will depart at 8:00 pm and arrive in Ha Giang at 5:00 am. Some bus brand names are: Bang Cuong, Bang Phan, Cau Me, etc. There is no need to worry about means of transportation in this place since there are many places to hire a motorcycle with price rental ranging from 200,000 – 250,000 VND/day. You should remember to get all motorcycle documents including motorbike insurance and carry your personal documents such as driver’s licenses and Identity Card. It’s often cold at night and in the early morning; hence, you should remember to bring a warm jacket. You should ask for permission of the owner before wandering in traditional buckwheat fields. Do not tread on flowers and remember to pick up trash before leaving. Some delicacies that you should not miss include: mèn mén, corn cake, corn wine, thắng cố, etc. 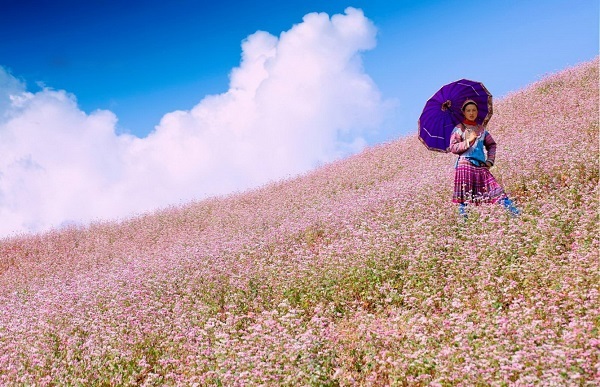 When the golden sunbeams entangle on every street corner of Ha Giang (often in October), it’s time to enjoy endless pink triangle buckwheat (traditional flowers) fields in Ha Giang province. Let’s go to Ha Giang to see flowers.